An adorable toddler is in the midst of all the action at the United National Congress Monday night forum at El Dorado West Secondary School earlier this week. THE Opposition cannot be run by ten leaders, Opposition leader Kamla Persad-Bissessar told a packed meeting of the United National Congress (UNC) at El Dorado West Secondary School on Monday. 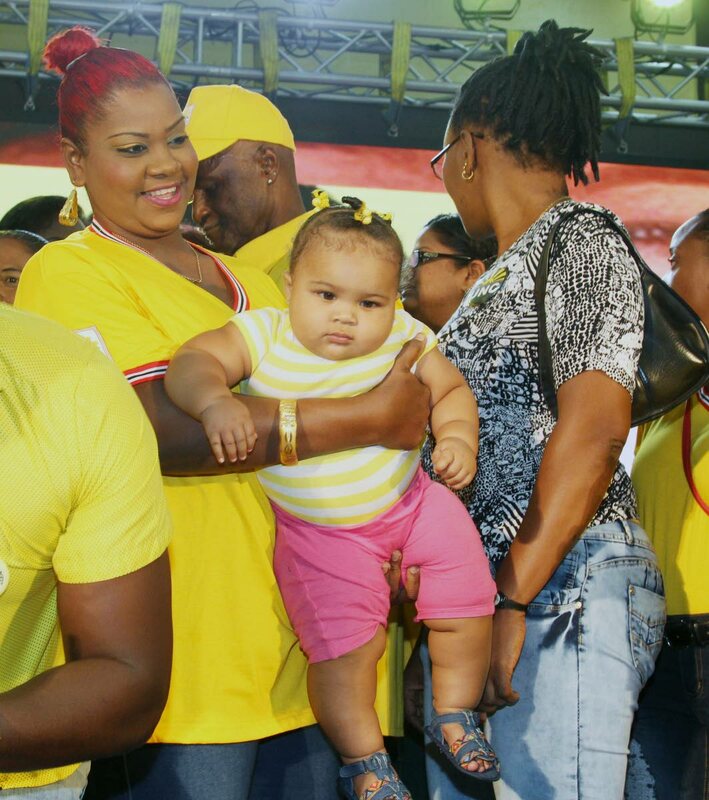 She dug in her heels after her statement to a UNC national congress meeting in Couva last January that the party was “strong enough to win alone,” rejecting the idea of a coalition, which had brought her to power in 2010. She said the UNC was a party for all. “We may have made some mistakes along the way. I apologise. I have learnt a lot. Those who don’t learn from mistakes are doomed to repeat them.” She detailed her plans for a UNC government to develop the country, by way of 12 "prosperity engines" across the country. Topically, she asked if an initial call to sell Paria Fuel Trading Company (subsequently rescinded) was a crisis manufactured by a government that could not even properly buy a boat, in an apparent reference to the Galleons Passage. Three "engines" are planned for the East West Corridor: the Tamana "SolarTech" Renewable Energy Park, the East-West Biotechnology Manufacturing Corridor and the Piarco Aircraft Maintenance, Repair and Operations Hub. Investors will be invited for each, she said, in contrast to the current government's trying to run a seafood processing company. She said former Tunapuna MP Mervyn Assam would help, even as she teased that Trade Minister Paula Gopee-Scoon’s biggest project to date has been a mere bubble-gum factory. Persad-Bissessar said the SolarTech park could supply the Caribbean with solar technologies. The biotechnology manufacturing zone, she said, will attract entrepreneurs and firms (both local and international) to create applications in agriculture, health and wellness, and industrial and environmental biotechnology. These could include therapeutic plants, exotic livestock, aquaculture, bio-pesticides, crop genetic improvement, ageing medicine, generics, bio-informatics and environmental conservation. She touted the planned Piarco hub, to meet a lack of major aircraft maintenance facilities in the Caribbean, so that airlines must now have aircraft repaired overseas. Persad-Bissessar ended with a rallying call. “In Tunapuna, as in every constituency, we need to take back our country. The UNC has a plan to transform TT, but we need all hands on deck. Your support on the ground, in our party groups, at the planning table, is what will make the UNC an unstoppable force in the upcoming elections. Reply to "Kamla: Can’t have 10 leaders"